2008 January archive | YORK BLVD. With the presidential races shedding the fat of the also-rans, Yorkblvd has decided to throw our considerable political clout (2 votes and limited disposable income) behind a presidential candidate from each party. 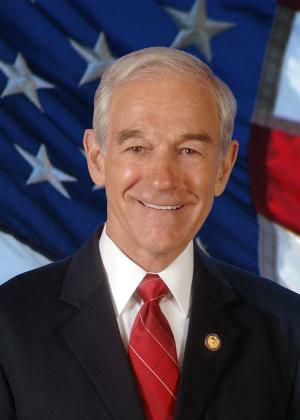 With last night’s travesty of a Republican debate (which really should have been named the McCain/Romney debate as the other invitees were barely addressed in the 90 minute program), we present our GOP endorsement for president: Texas Congressman Ron Paul. The time has come to limit the ever expanding scope of the Federal Government. Our Bill of Rights was crafted to protect individuals from the abuses of government, and while I don’t subscribe to any Orwellian conspiracies, this country has taken an alarmingly blithe attitude towards rule of law lately. The executive branch feels free to flaunt Congress and the courts, Habeas Corpus is being suspended in the American Judicial System, the government can tap your phone without a warrant, and still, Washington thinks it knows best how to govern 50 diverse states spanning seven time zones. See, for example, California’s (and ten other states’) legalization of marijuana for medicinal purposes. Despite California voters’ wishes, the Federal Government maintains its costly and ineffective war on drugs by raiding these clinics and prosecuting their owners. Or, examine the on again off again debate on gay marriage. Washington is actually considering amending the constitution to ban two men from marrying each other. Wasn’t this document drafted to decide more important issues than sexuality? If Wyoming wants to ban gay marriage, Massachusetts wants it legal, and California wants it somewhere in-between, what’s the problem? Why should the moral compass of constituents in Arkansas and Oklahoma define Hawaiian’s relationships? These two issues are merely microcosms of a Federal Government that finds it necessary to cast a wide net of legislation across a country they have clearly lost touch with, and what frightens me is that while the candidates are crawling over themselves to claim the mantle of the next Ronald Reagan, neither Romney, McCain, nor Huckabee seem willing to diminish the power of the federal government, the hallmark of what people loved about Reagan. Instead, the candidates argue the details of how to best wield the government’s power to meet their own social and ideological goals. Congressman Paul is the only man willing to take office and relinquish the broad executive power that has been so abused over the last 7 years. The man wants to dissolve the Department of Education not because he hates children, but because he believes that education is best decided on a more local (state) level. Ask a public school teacher how well “No Child Left Behind” has worked and you should have an accurate barometer of the inefficiencies of the Federal Government. Still, the foremost reason we are endorsing Congressman Paul is because his belief is simple: You know how to run your life and spend your money better than bureaucrats in Washington. If you want to donate to a $398 million Alaskan “Bridge to Nowhere” (or any one of countless other fiscal horror stories to emerge almost daily from inside the beltway) you are free to do so. Paul just wouldn’t use the IRS to threaten you with imprisonment if you don’t. Foreign governments (the Chinese foremost among them) hold the mortgage to our country and still, the party that used to represent fiscal sanity is only using its executive veto power now that Democrats are passing spending bills. As for the old scare tactic aimed towards outside candidates and 3rd parties of “throwing away your vote”, keep in mind that our congressional district is overwhelmingly democratic. In a closed primary, in a state where the delegates are awarded by congressional district, in a district with a limited number of registered republicans, every vote counts. If you agree with Thomas Paine’s famous edict, “That government is best which governs least”, Ron Paul remains the only candidate sure to reign in a dangerously overbearing Washington D.C.
Maybe because of the new year, or maybe because of the constant rain lately, or maybe just because we have been to the York almost every weekend for about 6 months straight, for whatever reason, this weekend we decided it was time for a change of venue. Something different. Completely different. So after some discussion and some Yelping, the guys at YORK BLVD. decided to head a little out of our neighborhood and go down to Footsies. Highly regarded on Yelp, post after post listed Footsies among the best dives in Los Angeles. Already intrigued, the review by a girl reminiscing (not fondly) about dating a foot fetishist who she had previously dubbed “Footsie” pushed me over the edge. This would be the place. Plus, it was just a couple doors down from our previously reviewed “El Atacor #11,” and I was already jonesing for some good tacos. Just past Cypress on Fig, Footsies can be easy to miss, especially when it’s pouring out. Like every hip bar these days, Footsies has no signage out front, other than the now ubiquitous neon “Cocktails” sign over the door. Inside, however, could not be any less understated. 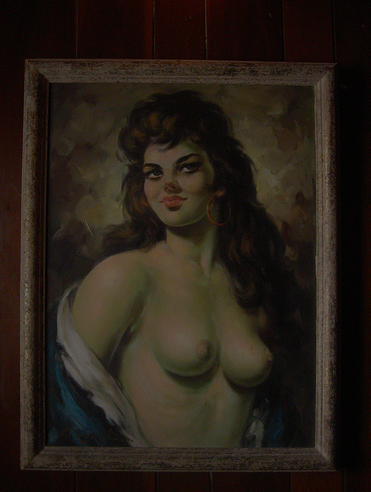 Dark wood paneling, leather booths, and pictures of ghostly, naked women adorning the wall, the place felt as though somebody turned Disney’s Haunted Mansion into a burlesque house. Towards the back was a classy looking pool table, up front was a jukebox (loaded with The Clash, Fugazi, Johnny Cash and currently pumping out some Blondie), and to our right was the bar. Guess where we went first. 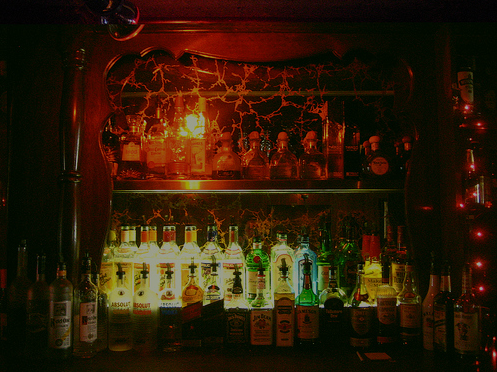 The ladies grabbed a booth beneath one of the spooky sultresses while we checked out the drink selection. Besides the full bar and standard well drinks, the choice of beers was pretty decent—with the glaring exception of nothing on tap. Regardless, Footsies stocks Stella, Newcastle, Pyramid Hefe, Longhammer IPA, Corona, Bud and even better, Pabst Blue Ribbon. Most bottles are $4, and PBR is a something of a bargain at just $2 a can. The scene at Footsies is exactly what you would expect at a hipster dive bar, although it was a little surprising to find such a hipster dive deep in Cypress Park. Dreadlocks, mod hairdos and Goodwill clothing outfitted most patrons. The jukebox was jamming until the DJ took over (much to the chagrin of our recently deposited dollar), and all in all everyone was having a laidback good time. Footsies definitely made its way onto my list great bars, and I can see myself going there frequently, especially if I’m in the mood for tacos and beer. Of course, it would be so much better if they had even just a couple of beers on tap, but then, nobody’s perfect. Does Highland Park’s S**t Stink? According to the LA Times, the Angelenos in this part of the city don’t think so. Read the attached story and send us your thoughts. I’ve never experienced this phenomenon, but then again, I might be one of those self-indulgent yuppies the Times (in all it’s countercultural glory) pans as not only narcissistic, but also disgusted by the handicapped. Now in the spirit of full disclosure, I do write for a website dedicated to the neighborhood, which probably lumps me in as part of the problem. (I don’t think Norwalk has much of a neighblog scene.) I also own property, which means in behooves me financially (but would be disgusting in reality) if a Starbucks and Pinkberry open up on all even avenue intersections of Figueroa. Still, part of the experience I have enjoyed in this part of town is a relative lack of anonymity. I see the same people at the dogpark, run into old college friends when I’m not expecting it, and frequently resume conversations with the same people at the York or Antigua. Plus, why the longing for The Wild Hare? I miss it about as much as I miss Toppers in Eagle Rock. They both hold some fond memories for me but their new incarnations improve on what I want in a bar in almost every way. What do you think? Is Highland Park getting (as my grandma would say) “Too big for its britches”, or should the LA Times stick to its above the fold coverage of celebrity DUIs? I don’t mean to be nasty, but coming between me and my 1903 is like walking between a mother bear and her cub…dangerous.